Earlier this week, the country was simultaneously outraged and captivated by the story of Ahmed Mohamed, a 14-year-old Muslim student who was arrested for bringing a clock, which educators and police thought was a bomb, to his high school in Texas. Support for Ahmed flooded in from around the country. His 3-day suspension and arrest was not only grounded in Islamophobia, but actively discouraged the curiosity of a bright, young mind. Tech juggernauts like Facebook and Twitter invited him to tour their companies, and educational institutions like MIT, NASA, and TAMS opened their doors, with the latter offering him a one-year scholarship. Even President Obama said he should come to the White House. One of the things that made Ahmed’s ordeal particularly heartbreaking is this memorable image of him in handcuffs, sporting a NASA T-shirt. It not only broke our collective hearts to see such a young kid visibly scared and confused, but reinforced how genuine his curious nature and interest in science is. In solidarity, #IStandwithAhmed took over the Internet and this response by Pittsburgh-based artist Matthew Buchholz of Alternate Histories is simply amazing. 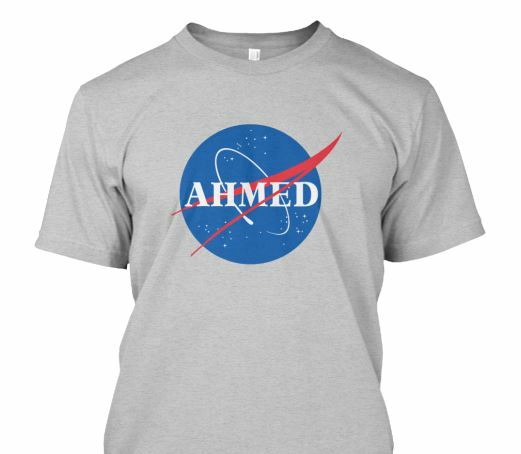 If you buy a shirt, you’ll directly benefit Ahmed and kids like him– all proceeds go towards a scholarship for Ahmed, plus memberships at makerspaces for other young innovators. You can also directly contribute to the I Stand with Ahmed LaunchGood campaign. Act now though as they are only available until Thursday!